DivorceCare is a biblical, Christ-centered divorce support group ministry. Our resources help you equip a lay-led team for effective and ongoing divorce ministry at your church. DivorceCare helps group members apply biblical principles as they heal from the hurt of separation and divorce. Throughout the videos and workbook, participants see how the gospel brings hope and restoration. Read our statement of faith. Since 1993, DivorceCare has equipped more than 17,000 churches worldwide. 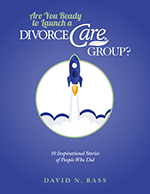 DivorceCare materials feature the counsel of 52 leading Christian experts on divorce and recovery topics. Read about DivorceCare’s history. Lay volunteers are provided with tools to recruit and train a leadership team, publicize the group, and start and sustain an ongoing program. Teaching ability is not required, as the videos provide biblical instruction from trusted experts. The DivorceCare kit has everything needed to start a new ministry: leader recruiting and training, promotion, weekly video sessions covering every major divorce recovery issue, group discussion guides, and participant workbooks for daily Bible study. DivorceCare places a strong emphasis on marriage reconciliation whenever possible. This makes DivorceCare ideal for divorced and separated people. Many marriages have been restored after individuals have participated in DivorceCare. When DivorceCare is combined with our companion DivorceCare for Kids curriculum (for children ages 5–12), your church can offer a family-centric approach to healing from divorce. Find out more about DivorceCare for Kids. DivorceCare provides free, ongoing phone and email support through our experienced ministry coach team. The LeaderZone, our private leader website, provides leaders with additional resources and a forum to connect and share with other leaders. Download our free resources for pastors and lay leaders in divorce recovery ministry. Q: Does offering DivorceCare imply our church encourages divorce? A: Definitely not. DivorceCare is built on a biblical, Christ-centered foundation. Scriptural teaching on marriage, divorce, forgiveness, and reconciliation is emphasized throughout the material. Because of the emphasis on reconciliation, we have heard many reports of group members reconciling with their spouse or ex-spouse. Q: Why do you encourage separated people to attend DivorceCare? A: Often, people are separated for long periods of time before a divorce is finalized. During that time, they are hurting deeply and need support, information, and encouragement. Because of the emphasis on reconciliation throughout DivorceCare, a percentage of separated people will see the wisdom of reconciliation and attempt to restore their marriage. A: No. DivorceCare is designed to be a lay-led ministry. Because the instruction and teaching is presented on DVD videos, featuring Christian experts on divorce topics, your DivorceCare group can be led by a team of mature lay volunteers. Most often DivorceCare groups are led by people who’ve been through divorce, have healed, and have a passion to help others find God’s healing, in the spirit of 2 Corinthians 1:3–4.